For those of you who did not get in on my first giveaway, you have another opportunity. Here is GIVEAWAY #2. 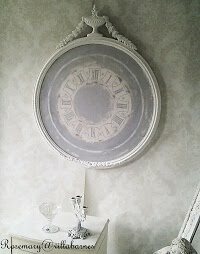 Everything in this vignette was hand painted by me, with the exception of the silver plate stand. 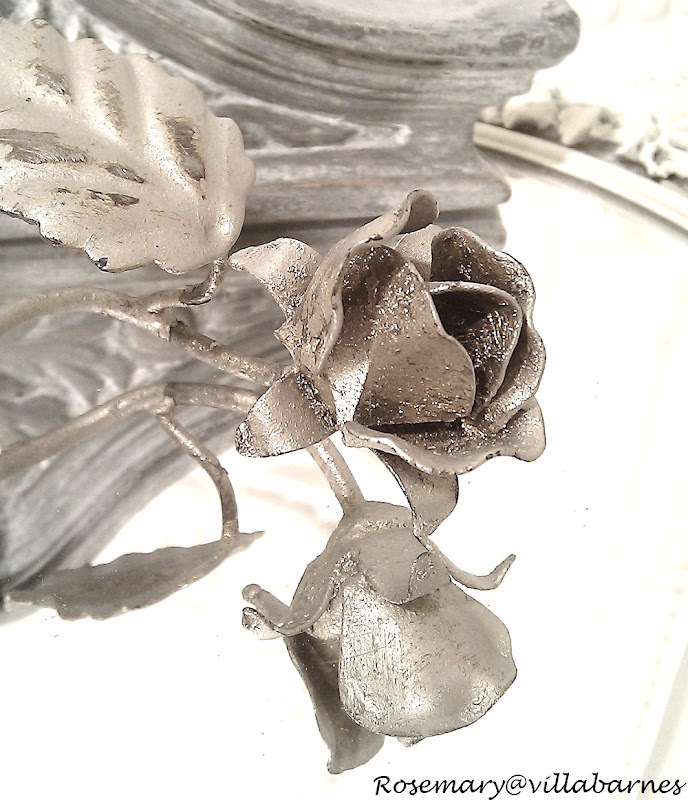 It includes two of silver leaf metal roses. 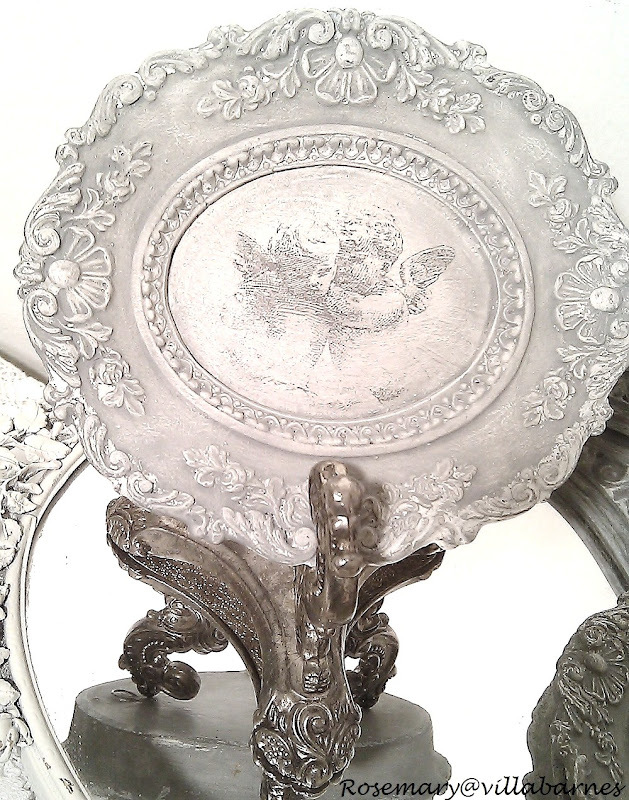 I have also included another transfer art piece, ornate frame, silver plate stand, ornate embellishment, and ornate rose mirror. 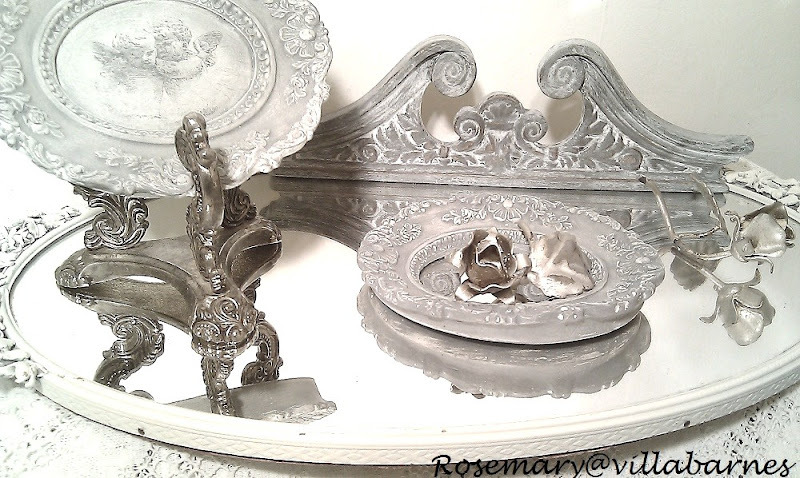 The silver stand could also be used as a support for a bowl, plate, etc. The ornate piece in the back has a hanger, and would make a nice embellishment just about anywhere. The winner will be chosen at random, and announced Saturday, January 21th. Two more giveaways to follow this month. I have been a follower of your blog for a while. Love what you do! I would LOVE to win all of this villabarnes loveliness! I shared it on twitter too! I would Love to win this beautiful giveaway! I have been following for a few eeeks now and I love your stuff! I meant to say weeks- not eeks! And I would love to win this give away! Fun giveaway! Yes, I'd love to win!!! I like this giveaway is even better than the last one! I'm a follower! I would love to win this and will post again after I have time to put it on my blog! i'D bE tIcKlEd tO wIn ...... !! I love this beautiful vignette and found you doing a search. I will be a loyal follower! I'd love to win it so beautiful. I am already a follower.. Your work is beautiful.. I am a follower, and love all you do - thanks for the chance to win some of your gorgous creations and fabulous finds! I am a follower of your beautiful blog! I would love to win this gorgeous giveaway!! Wow! Thanks for the opportunity! I never win and have never won a giveaway, but hey...maybe this time. I shared this giveaway in a post on my blog! This vignette is beautiful! I would so love to win it. Oh my. I love those pieces. You've put together a beautiful giveaway that I would be excited to win. 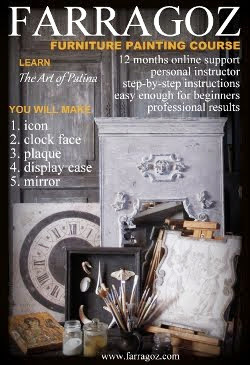 I have been following your blog for awhile and really enjoy your creative talent. I have been a long time follower and a happy one you never disappoint. Oh my gosh, more loveliness, Rosemary! These are all so pretty! I am a follower. Did I forget to tell you how much I wanted to win your gorgeous items. Oh this is a beautiful giveaway Rosemary AND congratulations to the lucky winner of your previous giveaway! I am one very happy follower! Another lovely vignette! Please include me in this wonderful giveaway! I love all those pretty goodies. I am a faithful follower of your blog also! another absolutely gorgeous giveaway! merci for the opportunity to win! I would definitely love to win this. What a wonderful giveaway! I would love to be entered. Thank you! and I was following you in my google reader, but now I have signed up to follow through your google friends. And I'm posting it on my sidebar right now! [Yup....I want to have some Villabarnes in my house badly....lol!] Anything else I can do to win.....like.....wash your car....walk your dog.....shovel your sidewalk.....? hehehe! 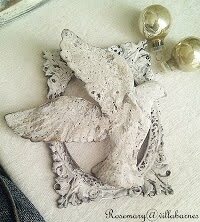 another fabulous giveaway...best of luck to everyone..
Love what you are offering for a giveaway~ And I love your blog, which I have just found through a friend of mine~ Thank you for putting me in the running! Already A follower, would love to win. I would love these beautiful treasures for my home. I have your awesome giveaway on my sidebar. Yes, I'm a long-time follower via RSS feed. You know how much I love your vignettes and finishes. Oooooohh, I'd love to win these. How generous of you! You are so kind to add another giveaway...these pieces are phenomenal! and I am going nuts thinking of the possible places and uses for them...Please include me in the drawing and thanks again for the chance! You are 2 kind! 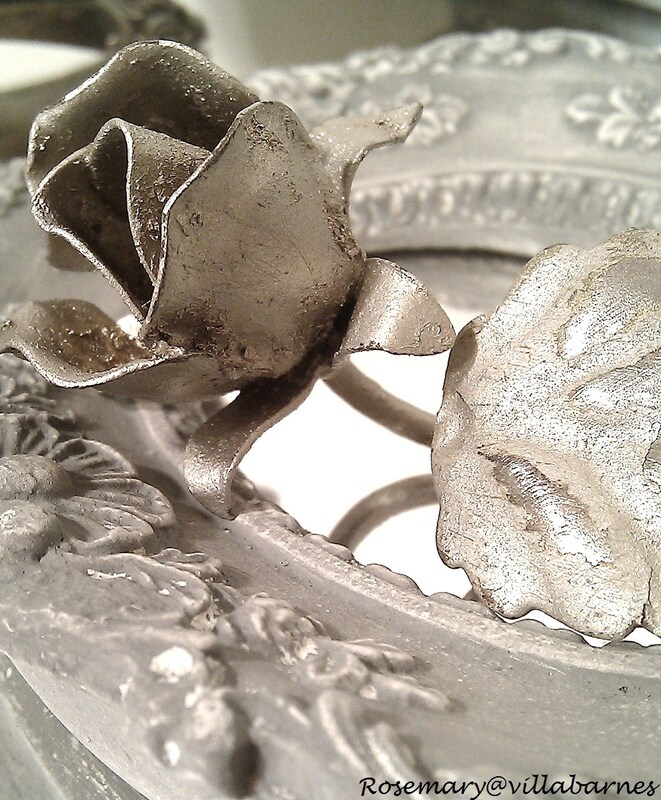 Rosemary, your pieces are so beautiful! I never miss one of your emails. Never know what your going to do next, and always teaching us how to do it. THANKS! Sure would love to win this one! 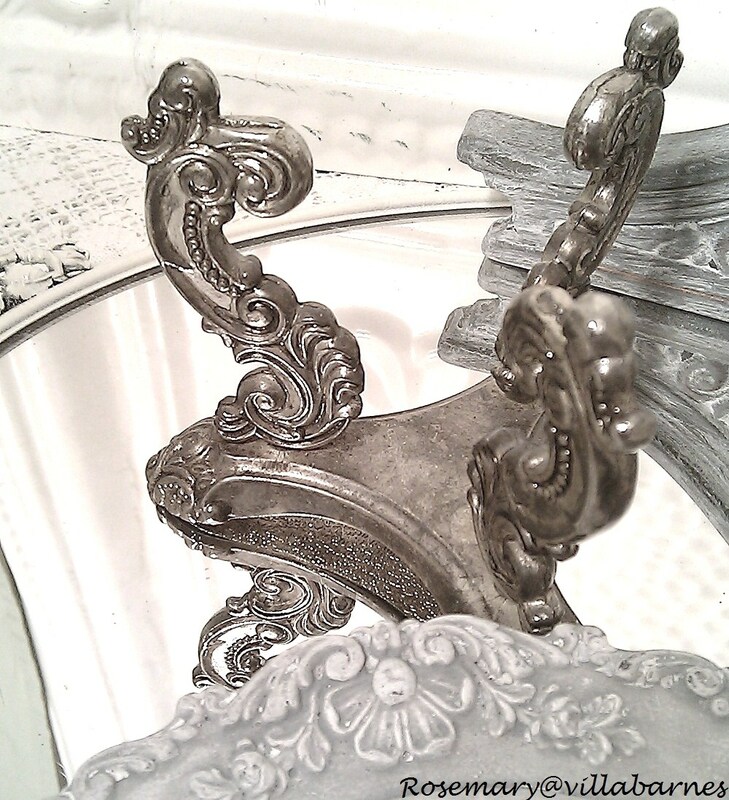 I am a follower of your blog and I LOVE your pieces- amazing how you put together the beautiful vignettes. I am a follower and I heart your art-full creations.....would love to win! Thank you. I'm a loyal follower of around 6 wks now & would so LOVE to win this!! 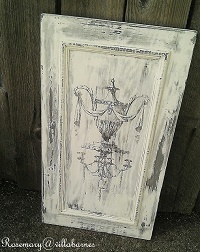 I can just picture how lovely it would look in our home!! Your work is just amazing!! Another awesome giveaway that I'd luv, luv,luv to win!! Blessings! I'm a follower and would love to win one your treasures! Beautiful! Thanks so much for offering these ...that stand is amazing! I'm already a follower! Folower since before the last giveaway. Beautiful vignette! I'm a follower. I'm glad to be a follower of your lovely blog. I would love to win your giveaway. Thanks for offering it. Rosemary, thank you for the opportunity to win yet another of your beautiful creations. I am a follower of your blog. 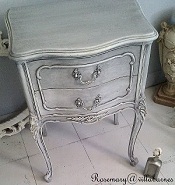 I would be so honored to win this lovely vignette! I will let everyone know about this giveaway on my next blog post! I'm already an amazed follower. See the drool? I friended you again on Facebook. Would I like to win? UH, hear me squeal all the way from MO, lol. I've been a blog subscriber for about six months, and look forward to your posts. Keep up the beautiful work! I'd love to win your vignette! Gorgeous!!! Happy New Year! Added it to my blog!Thanks Rosemary! I so would love to win some of your treasures! 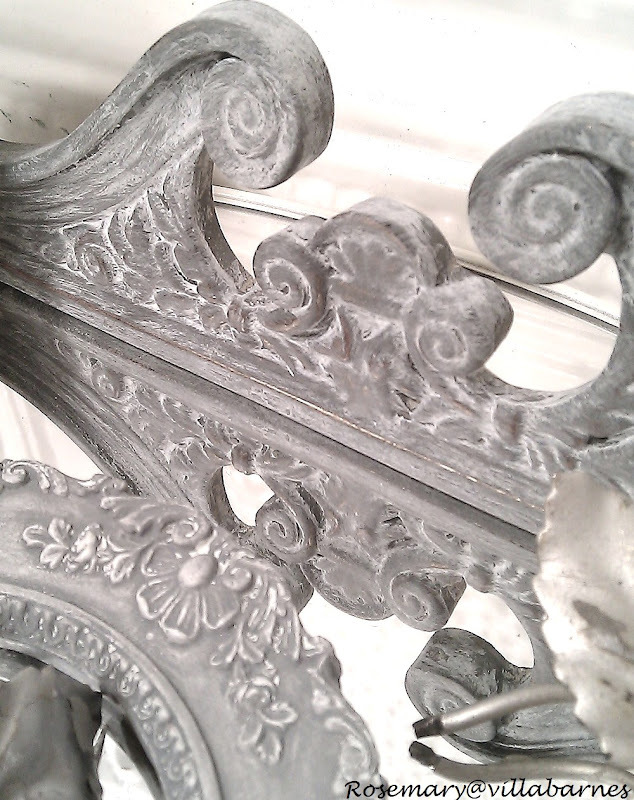 I have been dying for a mirror like that! How sweet you are to offer this wonderful giveaway! I put the giveaway in my sidebar! Thank you! Rosemary, wow another fabulous give away! I am a follower and love your blog. Hi Rosemary, your talent never ceases to amaze me. Please enter me in your wonderful give away. I am posting about your give away on my sidebar. I am also doing a give away right now. Hop over if you get a chance and see if it's something you might like. Thanks for the chance of winning these wonderful items! I have been a follower for a few months now and absolutely love your blog!!!!!! You are so open with all your techniques and i find that so refreshing! I've never won a thing but feel lucky simply because i stumbled upon your blog! Beautiful! Would love to have them in my home! Please enter me! And, thanks to Jodie for inviting me here! I am already a follower and each day I am amazed at your talent. It leaves me breathless. 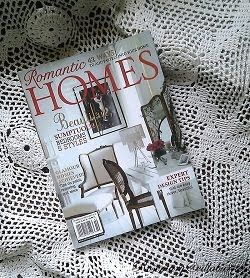 I am a follower of your lovely blog & would love to win your beautiful home decor items! I just posted a link on my giveaway list on my sidebar! You are one talented lady! Of course I would love to win! 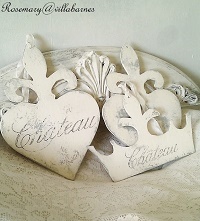 I could really use these to add some special touches to my home! Thanks for such a wonderful giveaway! I want to win!!! Thanks, Rosemary! I Follow you! (and glad I do...) Gosh I LOVE gesso! I just discovered your blog ♥ and became a Follower (new stalker!) Would love to win your beautiful pieces! I may have to wrestle my daughter-in-law for them though if she sees them! I would dearly love to win your lovely giveaway, Rosemary!